Gold demand jumped 21% in the 1st quarter of 2016 - its strongest first-quarter on record, according to the World Gold Council. This is not totally unexpected, as negative interest rates, worries over slowing growth in China, and uncertainty around global monetary policy fueled investor need for risk mitigation. Global equity markets began 2016 firmly in a downward trend; some regions, including Japan and Europe, entered into a bear market. The S&P 500® posted its worst January performance since 2009. Gold, however, registered a positive 4% return as volatility dragged most assets lower. Turbulent and choppy markets, like those we saw through mid-February, enable investors to reexamine the strategic role gold may play in a portfolio. While it may be used tactically during periods of elevated inflation or persistent dollar weakness - as we saw after the Federal Reserve's first quantitative easing program - gold's most paramount role is a strategic diversifier within portfolios. The chart below demonstrates gold's performance during similarly recent tumultuous times, including the Gulf War, the Great Recession, and the demise of the bond-trading hedge fund, Long Term Capital Management (LTCM). 1. Gold can potentially improve diversification, given its historically low correlation with traditional asset classes, as the chart below shows. 2. The precious metal can also be a hedge against stock market volatility. Despite gold's historically low correlation with traditional assets, at times it can move in tandem with them. Rising correlation can occur when the market is facing liquidity constraints, from which investors liquidate gold to shore up assets in other areas of the portfolio. This may mitigate some of gold's allure as a portfolio diversifier. Nevertheless, a strategic allocation to gold may provide diversification for a portfolio in the long run. Nobel Prize-winning economist Harry Markowitz famously called diversification "the only free lunch." 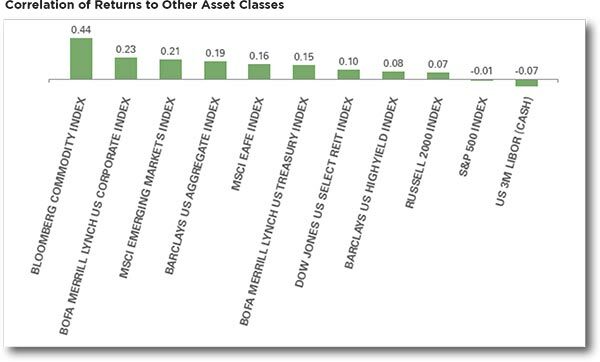 And gold is one asset with a unique, largely uncorrelated return pattern when measured relative to other traditional asset classes. 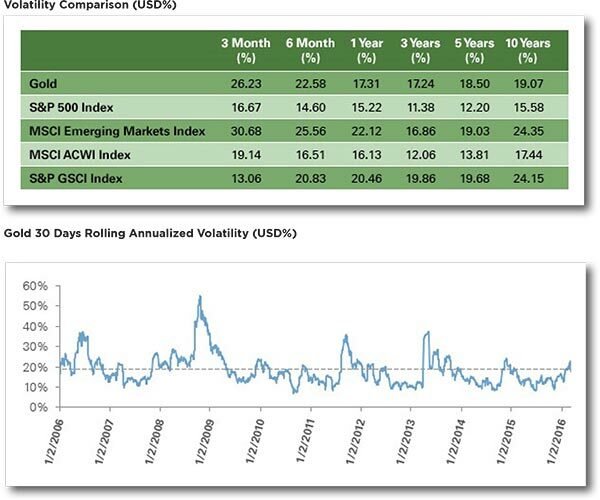 As the chart above shows, gold typically sits somewhere below the middle of the volatility spectrum, compared to equities and bonds. This helps gold to act as a hedge against equities, thus reduce overall risk in a portfolio. The mistake many investors make in gold investments is to use them in an attempt to time the market. Investors tend to flee gold when the stock market is rallying but turn to the precious metal when times get tough. However, by the time investors react, chances are the value of their portfolio has dropped, while the price of gold has risen, thereby eliminating some of the benefits of a gold exposure. Investors can hold gold in a portfolio to potentially guard against risks from unforeseen events. Gold can be viewed in isolation and kept in a bank vault, or as a strategic component within a portfolio. Over the long run, many experts believe that holding 2%-10% of a portfolio in gold can "potentially" improve performance. Assessing expectations for market volatility, along with your personal risk tolerance, can be a useful guide for determining an allocation to gold. Every investor is unique and special, we realize that. How much of a portfolio should an individual investor allocate to gold? This can be determined by considering personal expectations for return and volatility. History has shown that gold can potentially provide ballast in portfolios, having historically exhibited a low correlation to traditional asset classes. Yet gold is only one way to accomplish this task, and WT Wealth Management employees many risk mitigation techniques daily. Gold ETFs, such as SPDR® Gold Shares [GLD®], provide investors an efficient way to gain access to the gold market without having to pay the transportation, storage and insurance costs of holding physical gold. Holding gold ETFs allows investors to view their gold allocation holistically across their entire portfolio, and these gold funds provide liquidity, flexibility and accessibility. For instance, more than $1 billion worth of GLD shares trade each day, putting GLD in the top 99th percentile of all stocks and ETFs traded on NYSE Arca. In addition, GLD investors can buy as few or as many shares as they wish, giving them ownership to fractional ounces of gold. GLD also trades the way ordinary stocks do, allowing investors to buy, sell and hold this ETF through standard investment accounts. In many cases with GLD, investors can readily integrate and measure gold as a strategic presence in a portfolio that diversifies risk and can be incorporated into a broad asset-allocation framework of investing. 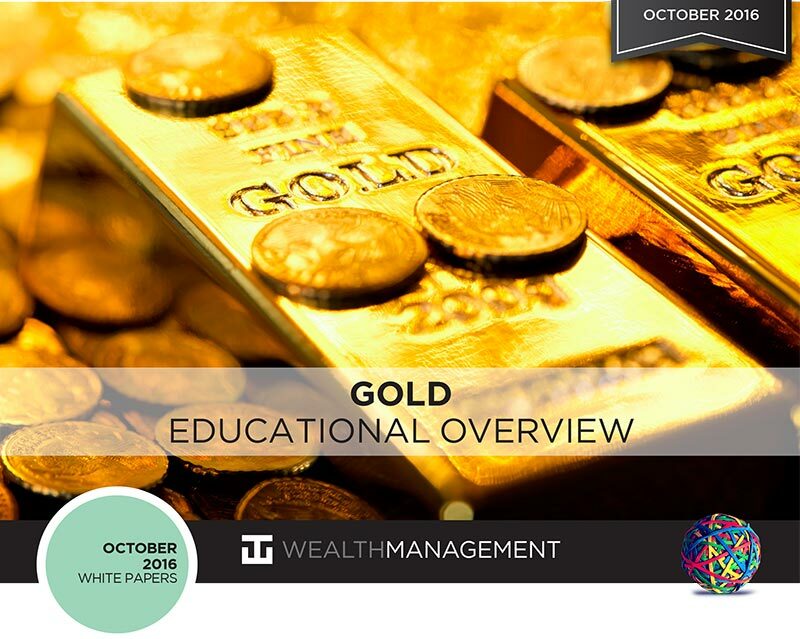 In general, WT Wealth Management does not allocate to gold or any of the precious metals. If investment prospects have become so risky, and uncertain, that gold becomes a good choice, we would rather have exposure to US treasuries and cash. Our feelings with the precious metals is that they tend to trade on fear, economic turmoil and global uncertainty. Gold can be just as volatile as any other asset class as news sways investors' fears. Gold is an asset class with no yield, no dividend, no earnings or PE (price to earnings) to evaluate. At WT Wealth Management we have strong feelings that we will not invest in any investment vehicle if we are unable determine whether it's priced expensively, inexpensively or if we can't determine if it's currently undervalued or overvalued. We feel in our role as a fiduciary, it would be nearly impossible to justify exposure to gold simply because we are "scared." However, we do understand gold's attraction to many investors. We understand that you are unique and have certain feelings about your account. We respect that and always say every account is like DNA and should reflect who you are and what you believe in. So, the team at WT Wealth Management would be happy to discuss an allocation to Gold in your portfolio at any time. Barclays 1-3 Month U.S. Treasury Bill Index: A fixed-income benchmark, including publicly issued dollardenominated zero-coupon US treasury bills with a remaining maturity of less than three months and more than one month. They must be rated investment-grade, have $250 million or more of outstanding face value, and be fixed-rate and non-convertible. Barclays U.S. Aggregate Bond Index: A benchmark measuring the performance of the US dollar-denominated investment-grade bond market, which includes investment-grade government bonds, investment-grade corporate bonds, mortgage pass-through securities, commercial mortgage-backed securities, and assetbacked securities that are publicly for sale in the US. Barclays EM Local Currency Government Diversified Index: A benchmark measuring the performance of fixed-rate local currency sovereign debt of emerging-market countries. The index includes government bonds issued by countries outside the US in local currencies with a remaining maturity of one year or more. They must be rated B3/B-/B- or higher, be fixed-rate, and have certain minimum amounts outstanding, depending on the currency denomination of the bonds. Barclays Global Aggregate - Corporate Index: A benchmark broadly measuring the global investment-grade, fixed-rate, fixed-income corporate markets outside the US, as part of the Barclays Global ex-USD Aggregate Bond Index. Barclays U.S. High Yield Corporate Index: This covers the universe of fixed rate, non-investment grade debt. Eurobonds and debt issues from countries designated as emerging markets (sovereign rating of Baa1/BBB+/ BBB+ and below using the middle of Moody's, S&P, and Fitch) are excluded, but Canadian and global bonds (SEC registered) of issuers in non-EMG countries are included. The index includes both corporate and noncorporate sectors. MSCI ACWI Index: A free-float weighted equity index including companies in emerging and developed world markets. MSCI Emerging Markets Index: This captures large- and mid-cap representation across 23 emerging-markets countries. With 834 constituents, the index covers about 85% of the free float-adjusted market capitalization in each country. S&P 500 Index: A popular benchmark for U.S. large-cap equities that includes 500 companies from leading industries and captures approximately 80% coverage of available market capitalization. S&P GSCI Index: A production-weighted index launched in 1992 that tracks the performance of 24 commodity futures contracts. The index tilts to commodities that are more heavily produced globally, so it weighs more heavily to crude oil than, say, cocoa.